A beautiful addition to my Christmas display! We put this 48" star on our outside stone wall and the warm white lights look great! Be careful locking the points in place; they can be a little tricky and you don't want to crack the plastic, but it is sturdy when done correctly. Reviewed by Saundra L S.
Years ago, I bought a large star (52 in) to hang in my front window for a Christmas decoration. My husband liked it so much that he decided to display it all year long. After the 10th year, the star lights began to go out, one by one. I ordered this star (48 in) to replace my original star. It is a wonderful replacement. 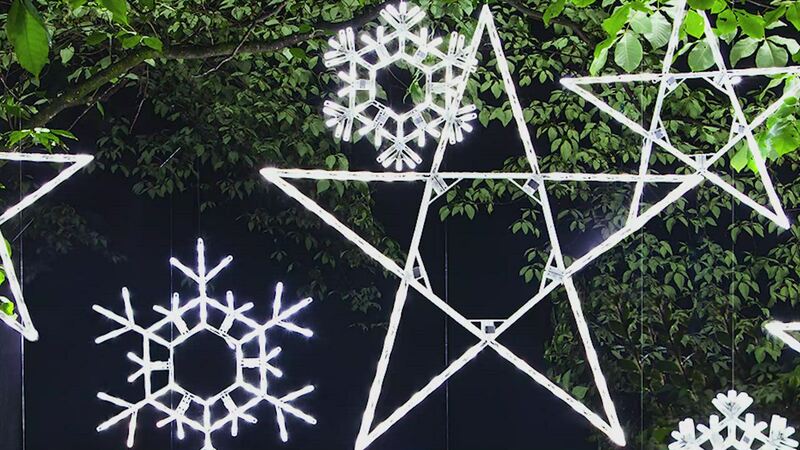 The structure is sturdier than the original, simple to stabilize, shines brighter and is very easy to hang. Very pleased with this star. It looks stunning above our garage doors when lit at night. Is more fragile than expected, I wanted a star to put up on my tower with my wind generator. This is about the 6th star I have bought & I have been pleased for years with this product. Just what we needed to decorate our 360 SL power boat for Christmas. Would highly recommend. Wonderful, bright illumination. Easy to assembly. Given the price, the product is cheaply made. Still looks pretty on the house. I am returning this item. It is poorly made and will not stay clamped so that the star will stay open! The string of lights will not stay inside the frame! I am extremely disappointed. Looks great, and I am looking forward to seeing it on my house. Light Count: 70 Product Dimensions: 48"